2015 has been a restless year of competition among mobile telcos in Malaysia, where key players constantly try to outperform each other and makeself-proclaiming titles (widest coverage? fastest Internet?). Ultimately, what users want to know is who the best actually is. We can’t help you decide who’s the best, but we can tell you who has the fastest speed in Malaysia. Ookla, a global leader in broadband speed testing that owns the widely used Speedtest app, has recently given the Fastest Mobile Network award to one of the telcos, and the winner is none other than U Mobile, the youngest player in the market! According to Ookla, the top ranking was based on more than 5 million speedtest results collected over six months via their proprietary Android and iOS mobile applications. The data is thoroughly analysed before a winner is chosen. 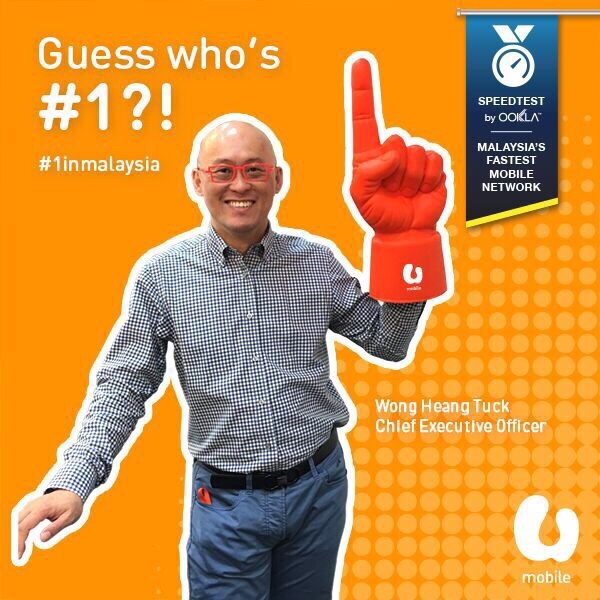 “It is testament that we are indeed providing the best mobile customer experience possible to all Malaysians. #DATASTRONGNETWORK!” said Wong Heang Tuck, Chief Executive Officer of U Mobile. Now folks at the orange hue telco must have been really thrilled over the news, maybe they are also feeling pretty festive, because they actually announced its Year End Promo that gives an extra 1GB for FREE to reward all existing and new U Mobile subscribers as a celebration. Generous or what?! All existing U Mobile users will automatically be given the free extra 1GB quota in their data plan while new users will get it upon registration. Bear in mind that the free 1GB offer is only around until the 31st of December 2015 so it’s a limited deal only. So what are you waiting for? Visit link and claim your #yearendbonus from Malaysia’s fastest mobile network now!